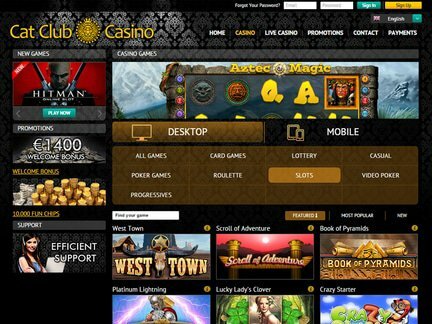 Cat Club Casino uses SoftSwiss Casino Software, Microgaming (QuickFire) and Ezugi. An engaging gaming environment is to be expected with such partnerships. Besides, the casino's operator has a lot of previous experience with running casino games. Evidently, the experience has also been helpful in predicting what type of promotions would appeal to the visitor. The welcome bonus offer has been described as 'sensational' due to the huge sum of money that is involved. 1,400 Euros is given out by the casino with the welcome bonus offer. Making a first deposit into the casino account makes the player eligible for 100 % deposit bonus deal. A maximum bonus amount is 200 Euros. The subsequent deposits also get nicely rewarded. The casino has a 50 Euro Cashback Bonus for real money players (wager 10 X) as well as a Random Free Spin Bonus with a maximum payout of 50 Euros. Best of all, the casino even grants play money to players without any actual depositing requirement. Coupon codes are also given out on a regular basis. The casino welcomes players from different language backgrounds. It is able to accommodate speakers of the following languages; English, German, Swedish, Russian, Turkish, Polish, Chinese, Japanese, Italian, Spanish and Dutch. The players from the United States of America are excluded from the casino based on residence restrictions. Otherwise, the casino is open to the world. The major games that can be found elsewhere can also be found here. All the classic casino games are present on the site. The list of accessible games would include; Blackjack, Roulette, Baccarat, Mega Moolah, Texas Hold'em, Caribbean Poker, American Roulette, European Roulette, Jacks or Better, Joker Poker, Major Millions, Super Fun 21 and Keno. Some of the games have been especially popular with the players on the web casino site. Interestingly enough, the popular game titles aren't always available on other casino websites. Here are a few of them; Book of Pyramids, Immortal Romance, Desert Treasure, Crazy Starter, Gold Factory, High Society, Merlin's Millions, Scroll of Adventure and Lucky Firecracker. Many of the games have nice-looking graphics. Therefore, it is really good to check them out in one's free time. This is yet another casino where the details of the jackpot winnings remain hidden from the public. It would nice to see a list of the most recent winners and compare the winning amounts. However, the jackpot winnings can easily exceed 10,000 Euros. They can definitely be higher than the maximum payout per month according to sources. The casino is still in its early stages of development, so to speak. For this reason, it has not been the subject of as much scrutiny as some other casinos. However, the complaints have not showed up over the admittedly short stretch of time. The safety of the customer is ensured by the 128-Bit Encryption. But there is a lack of contact options here. The e-mail contact form may not be sufficient. As previously mentioned, the operator of the casino has plenty of experience in the world of casino games. Two decades of dealing with this kind of stuff is not to be overlooked. 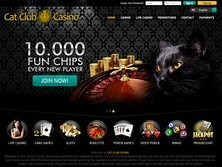 The Cat Club Casino was launched in 2014. Its gaming license was issued by the Central Government of the Netherlands Antilles. I am obviously impressed by the 1400 EURO Welcome Bonus deal at Cat Club Casino. I am somewhat less impressed by the customer support service. It isn't so much that the support is not responsive to inquiries. It's just that it does not seem robust enough for a casino that wants to expand its influence far and wide. In my opinion, the customer service could be improved with the addition of more contact methods. I was also disappointed by the lack of the winners list on the main page. In terms of the games, the mix-up of software providers is certainly a good idea. As for the gaming environment itself, it may not be as impressive as what I have found on larger websites. However, it can still meet my needs. I would like to see some more features that would distinguish the casino from other venues, since the large game supply is now a standard feature of many online casinos. But as a fan of the slots, I've had a decent time playing some of the tiles on here.